Glowforge is delaying initial shipments of its innovative 3D laser printer. The Seattle startup set a crowdfunding record this past October, raising nearly $28 million from thousands of backers who pre-ordered the printer. The original plan was to start shipping the “first units” in December. Glowforge CEO Dan Shapiro confirmed with GeekWire on Thursday that those shipments have been delayed, a move that has angered some backers who were expecting their 3D laser printers late last year. However, the company is still on target to deliver printers by June to those that pre-ordered during the 30-day campaign. Shapiro warned that future delays are possible. The whole team here is working like mad to make sure that all units from the 30-day campaign are, in fact, delivered by June. 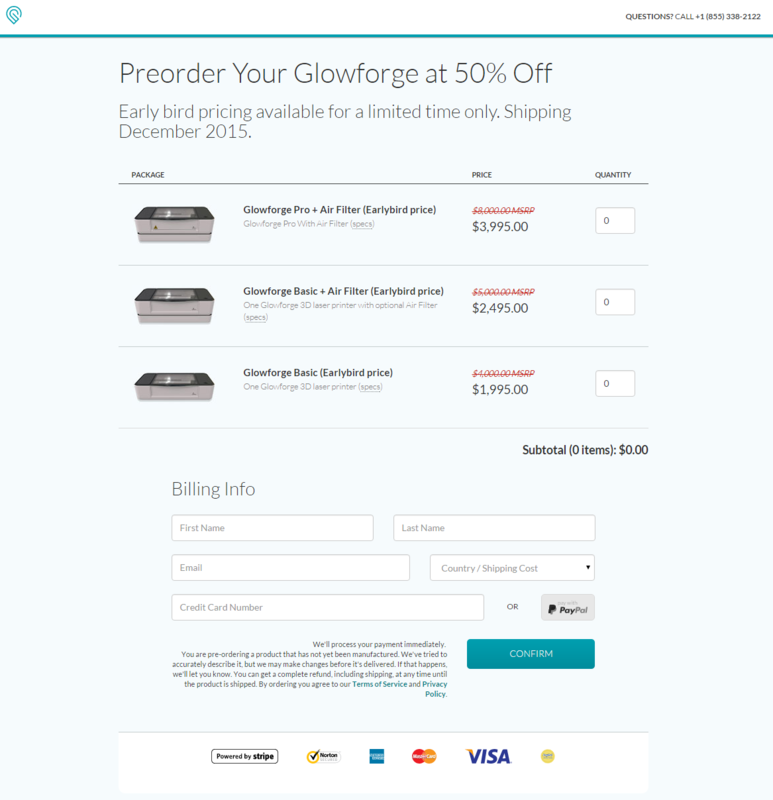 Those that pre-ordered a printer but want a refund can do so by emailing support@glowforge.com, Shapiro said. The device retails for $3,995, but the basic model sold for $1,995 during the crowdfunding campaign. You can still pre-order the printer for $2,395, but you won’t receive your shipment until “later in the year,” Shapiro noted. Those that placed an order after Oct. 24 — when the crowdfunding campaign ended — will receive their product “between July and September,” according to the company’s FAQ page. Some customers have expressed frustration with the initial delays on Glowforge’s Facebook page and on Reddit, where one backer wrote that “I’m going to take my $4,500 and give it to someone that can deliver a product with a deliver date better than 9+ months from date of order.” The backer, Reddit user KiltedCajun, said that it wasn’t clear at the time of purchase — five days into the campaign — that Glowforge was only shipping “beta” units in December. Those looking for production updates can head here. Glowforge was founded in 2014 by Shapiro, the brains behind the hit kids board game Robot Turtles — one of Kickstarter’s most successful campaigns ever — and fellow Seattle area startup veterans Tony Wright and Mark Gosselin. The company employs 22 people and has job openings for another 18 positions. The Glowforge device itself is different from most other 3D printers because instead of making objects out of plastic strands, it uses a laser to quickly cut and engrave products. Along with smartphone sensors built into the printer, the lasers allow the Wi-Fi-connected device to cut and engrave materials that are curved, uneven, or irregular. Dual cameras also measure the thickness of material to a precision of four one thousandths of an inch.